The hawksbill (Eretmochelys imbricate) is one of the less common sea turtles and is currently listed as Critically Endangered worldwide by the IUCN Red List. This is due in part to heavy predation by humans to use its beautifully colored shell to make ornaments and jewelry. This smaller turtle typically weighs 100-150 pounds and is about 3 feet in length. They are found in the Pacific, Atlantic and Indian Oceans but tend to stay closer to shorelines, feeding off of coral reefs and estuaries. 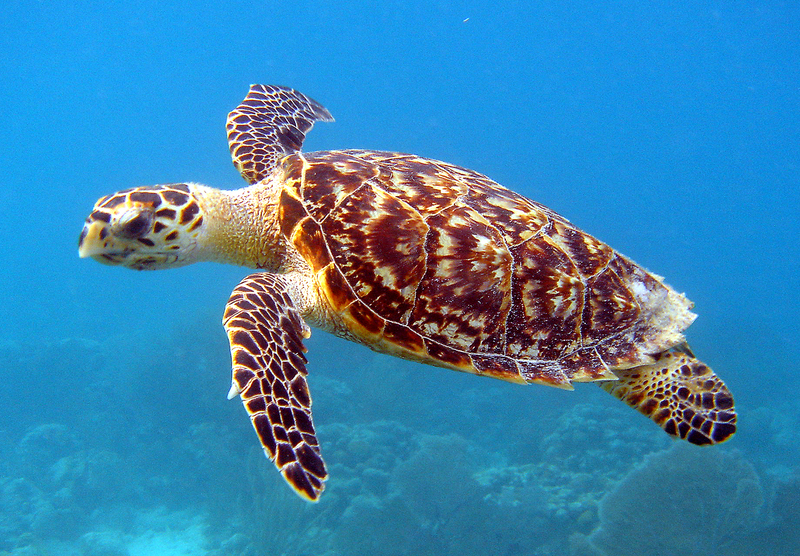 Scutes are larger, fingernail-like materials that overlap to form the shell of the hawksbill. These scutes are what makes the shell sought after by poachers, as the material is used to make anything from earrings to tabletops.